Sheep ranchers have long grazed their herds in the Beartooth and Absaroka mountains of Montana. The last sheep drive there took place in 2003. It’s a milieu in which man and beast, nature and technology, even past and present, memorably mix. Documentary filmmakers Ilisa Barbash and Lucien Castaing-Taylor first filmed there in 2001. They’ve previously made documentaries on such subjects as sweatshops in Los Angeles (“Made in USA,’’ 1990) and the international market in African art (“In and Out of Africa,’’ 1992). Their new film, “Sweetgrass,’’ opens at the Kendall Square on Friday after acclaimed screenings at the New York and Berlin film festivals. Barbash and Castaing-Taylor, who are married, both work at Harvard, she as a curator of visual anthropology at the Peabody Museum, he as director of the Sensory Ethnography Lab, and associate professor of visual and environmental studies and of anthropology. They live in Newton with their son and daughter. Last week they talked about “Sweetgrass’’ in Castaing-Taylor’s studio at Harvard. What follows is an edited transcript of the conversation. Q. Are all documentary filmmakers, at some level, anthropologists? Barbash: I don’t think they’re all interested in understanding the deeper reasons behind things. Probably documentary filmmakers cover a range between journalism and anthropology. Perhaps you could talk about a spectrum on which you could place documentary filmmakers somewhere between the two. Castaing-Taylor: In a literal sense, yes. They’re undertaking studies of humanity and our human condition. I would also say they’re both more and less than anthropologists. They’re not part of the academy, both for worse (because they don’t have the critical tools anthropologists have) but also for better (they don’t have those disciplinary blinkers). When I think of the best nonfiction filmmakers, most of them don’t give two hoots about anthropology or wouldn’t know what to think about anthropology or don’t have any academic pursuits. But their films are so revelatory and illuminating about the human condition that they seem more anthropological than most media made by anthropologists themselves. Q. Some of those filmmakers would be . . . ? Castaing-Taylor: There’s an amazing Czech filmmaker named Jana Sevciková. She’s made films mostly in Romania. There’s a trilogy about the history of nationalism there. I’m a complete atheist, but they’re the closest things I know to seeing a divine spirit. They’re sublimely beautiful and divinely spiritual. Alexander Sokurov is amazing, the Russian filmmaker. Less “Russian Ark,’’ which to me is a gimmick — whoop-de-doo, we can shoot a single take in 90 minutes on video — than “Spiritual Voices,’’ about Soviet troops on the Afghan border. It’s extraordinary, absolutely amazing. There’s this very different kind of documentarian — very empirical, very cinema-verite — Sergei Dvortsevoy. He made “Tulpan,’’ recently, a feature film that’s nowhere near as interesting as his documentaries. Q. What brought you to make a film about sheepherding? Castaing-Taylor: We got a call from some friends in New York who had been told about there being one last sheepherder in Montana who still took his sheep up in the mountains. Barbash: The sheepherder actually said there ought to be a film made about him. So we knew we had a willing subject. We contacted him, and the man he leased land from, in March 2001. Castaing-Taylor: I went up there the next month. It was lambing season. Q. How arduous was the shooting? You did all the walking the herders did, except while carrying cameras and sound equipment, too. Castaing-Taylor: We had three cameras. I had two, Ilisa had one. The big camera was too heavy to go on horseback, so I was basically on foot the whole time. It turns out I had to have double-foot surgery after we came down from the mountains. Q. Are the sheep the stars? 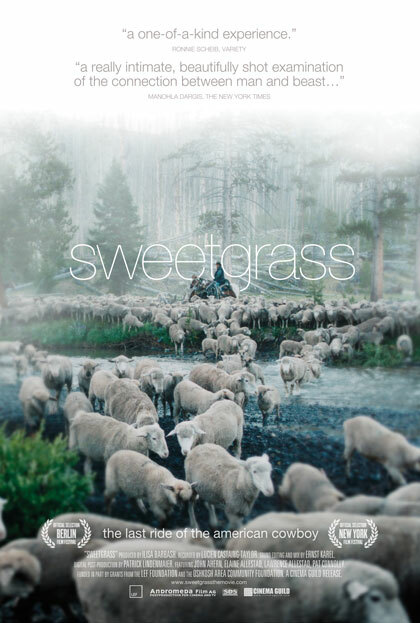 Castaing-Taylor: “Sweetgrass’’ was made over the course of a decade. It’s not as if we had a single, articulable set of intentions we sought to resolve in some way on film. One of the tensions we were aware of during editing, and even during filming, was that this movie was as much about ethology as anthropology. There was a point when I stopped being interested in the herders. I was interested in the sheep. The fact that sheep are this completely humdrum, overly allegorized domesticated animal [that] could be so interesting aesthetically was totally surprising to me. In the act of editing over the last year or so, we really foregrounded the animals at the beginning, and then we made the introduction of humanity much more subtle and gentle. Barbash: Also to bring in the difference between the herders’ relationship to nature and our relationship as the typical East Coast viewer. There’s such an irony when one of the cowboys is so miserable in the documentary, and there’s a pan of this magnificent landscape. Viewers must think, how could he not want to be there? We just fell in love with this whole lyrical landscape. Barbash: We’ve been told that. I grew up watching “Gunsmoke’’ and “Bonanza.’’ There are certain physical and vocal qualities possessed by the people in our film that remind me of John Wayne and the Cartwrights. Castaing-Taylor: My immediate reference, actually, was the pastoral, from poetry and painting. Typically, an outsider’s rhapsody or evocation of a bucolian, arcadian idyll — from Theocritus, in Greek, Vergil, in Latin, all the way up to Marlowe and Spenser and Wordsworth. And I grew up in Liverpool, but my grandmother lived in the Lake District, quite literally Wordsworth country. On weekends I’d go up there, this amazing sheep country. I found [the filming] was a return to childhood on my part, but transposed to the massive, gargantuan, monumental scale of the American West. But it wasn’t an explicit intention to revise the western or the pastoral. Castaing-Taylor: About 200 hours [laughs]. Barbash: That’s why the editing took so long. MARK FEENEY. March 28, 2010. Boston Globe.